It’s said that if you aren’t innovating, you’re going backwards. 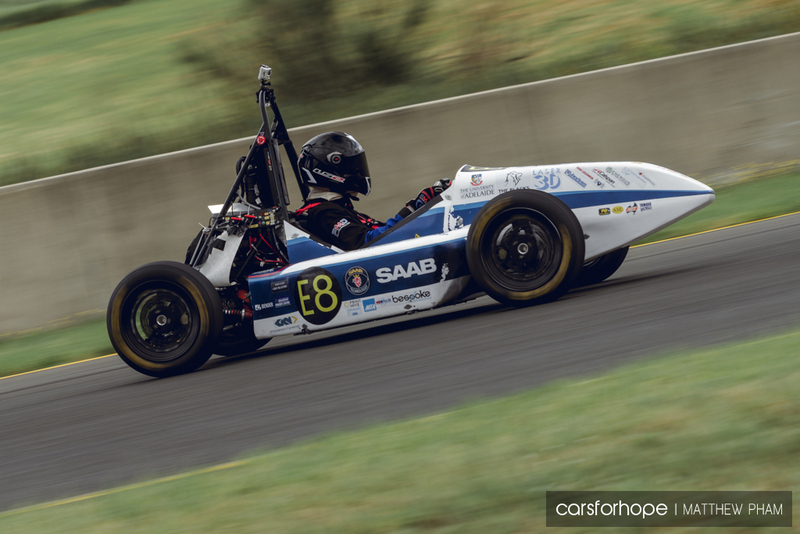 That saying rings no truer than in the world of motorsport, and innovation is the name of the game for the boys and girls who are dedicated to Formula SAE, or Formula Student as it’s also known. 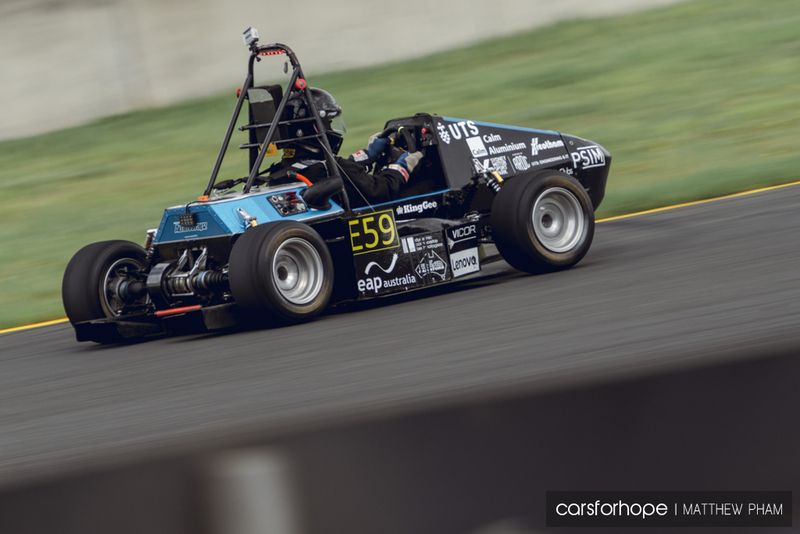 We’ve covered it before: F-SAE is an international competition pitting university racing team against university racing team each year. 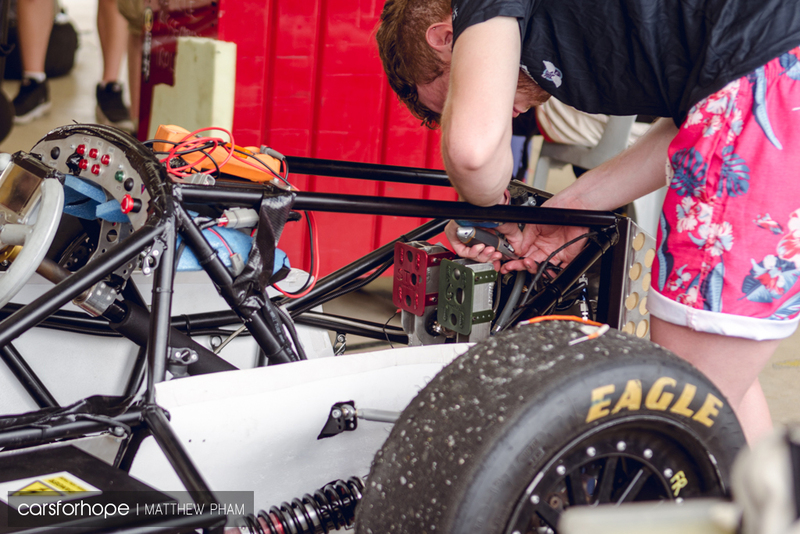 It’s often a grueling slog as teams design, manufacture and build bespoke competition racing machines to run them through a series of events testing their capabilities. I know how difficult it can be because I spent two of my university years involved in it. 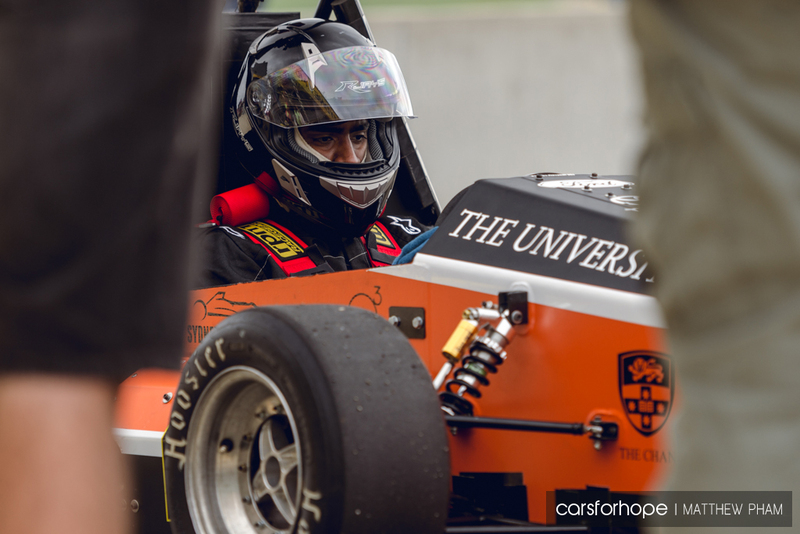 Some devote their whole university degrees to it – it almost becomes a degree in itself! 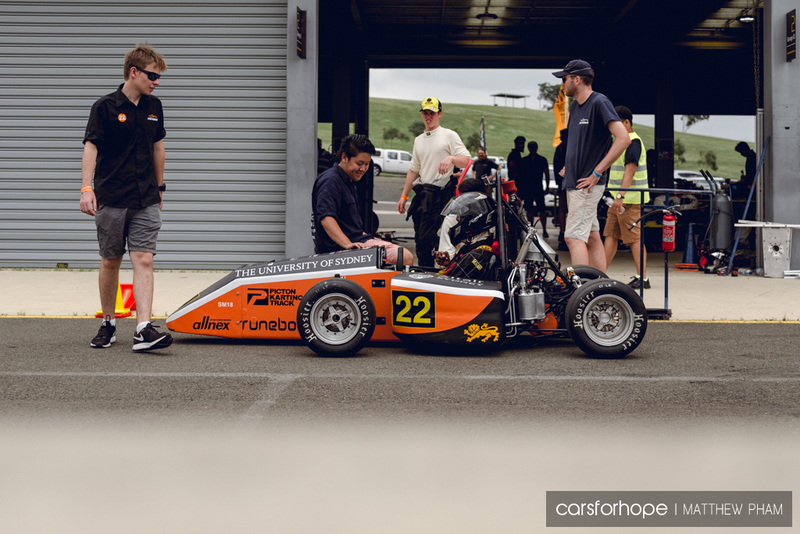 So when Anthony – previously of UOW Motorsport fame – got in touch and told us he was running a new Formula Student Sydney competition based upon the official one held each year by SAE Australasia, I was the first to put my hand up to check it out. It’s been a while since I’ve been in the company of a sizeable fleet of F-SAE cars. 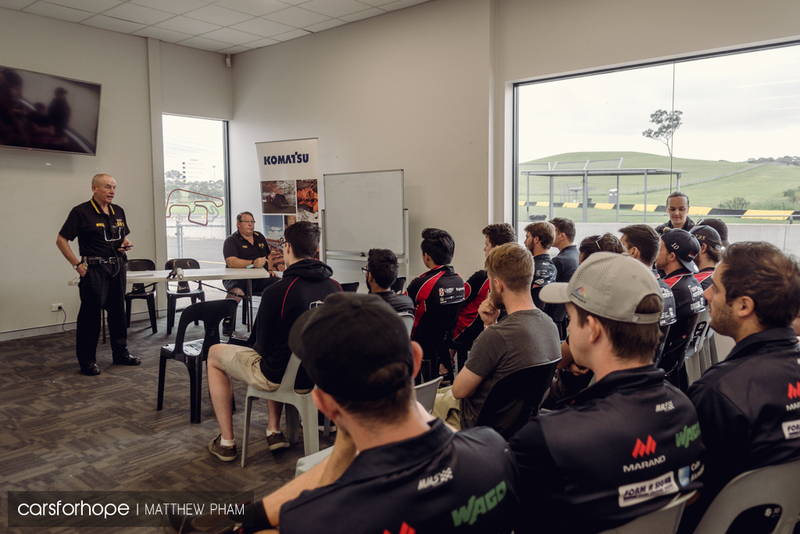 The grassroots event was supported by Sydney Motorsport Park and the Australian Racing Drivers Club, which is great to see given that the next step for many of the students once they have become graduates is the motorsports or automotive industries. 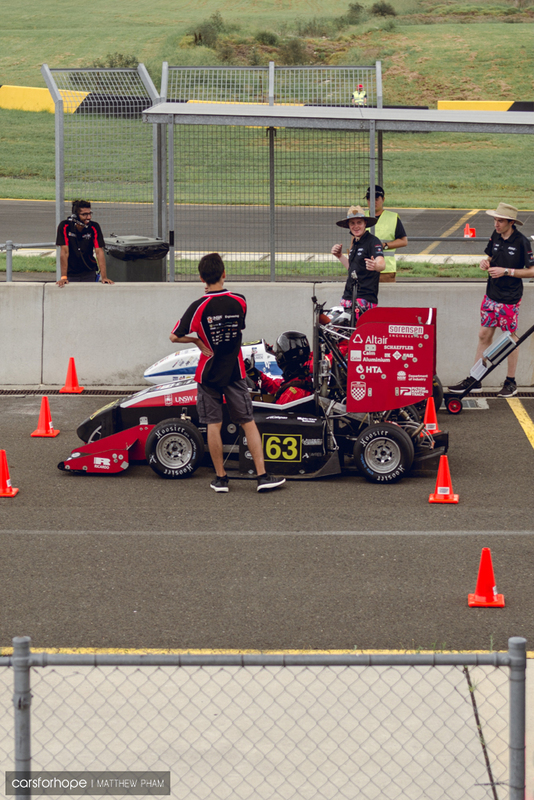 Teams came from NSW and beyond to compete, including University of Wollongong, University of NSW, University of Sydney, University of Technology Sydney, University of Adelaide, Australian Defence Force Academy and Monash University. 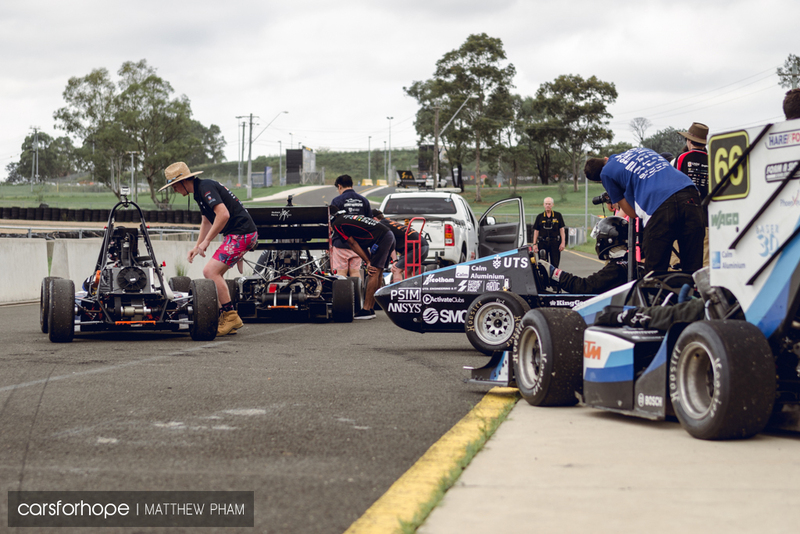 What I find so interesting about the Formula Student competition is how open the competition is to engineering design. 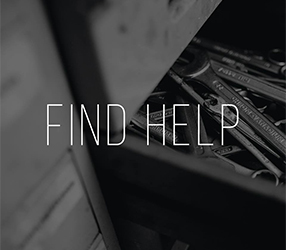 Of course, there are boundaries teams must adhere within – safety being the most prominent one – but then it is mostly an open field of possibilities. 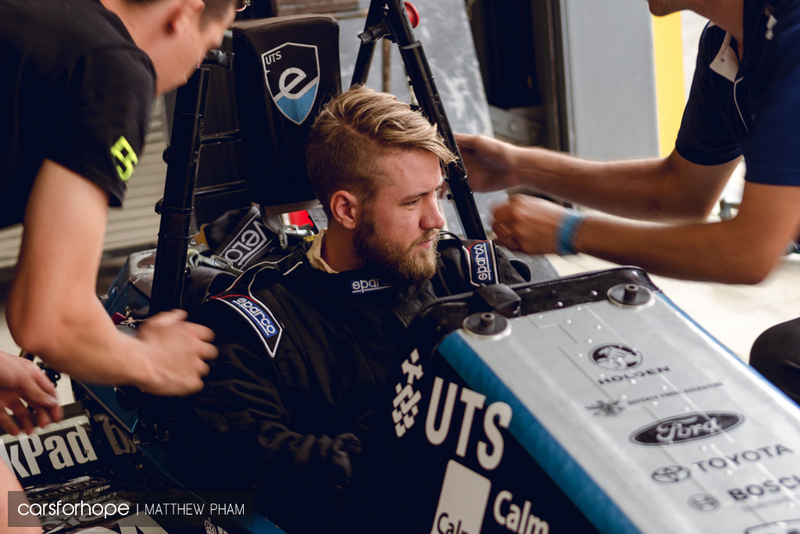 And in the years since I was involved, the growth of the EV (Electric Vehicle) class from the IC (Internal Combustion) class has opened up the doors even more. 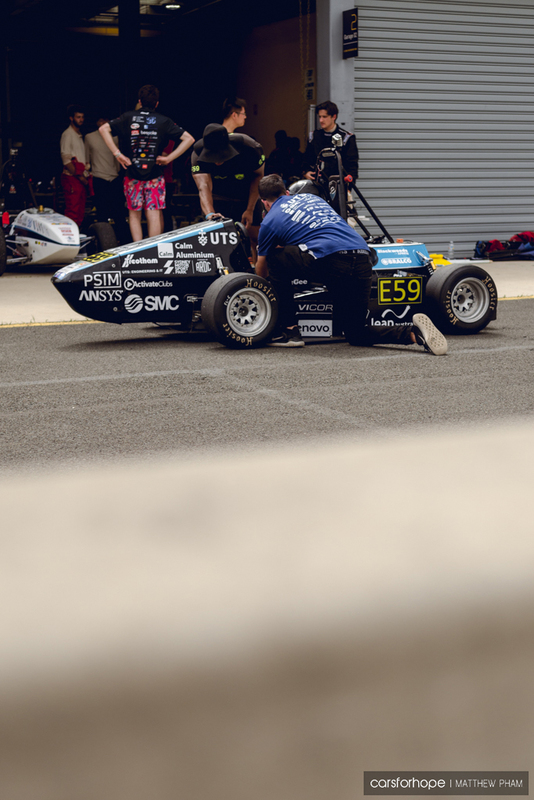 While many motorsport purists will scoff at the notion of EV racing, I think the level of inginuity involved for EV race cars is itself enough to keep at least one eye on its progress. 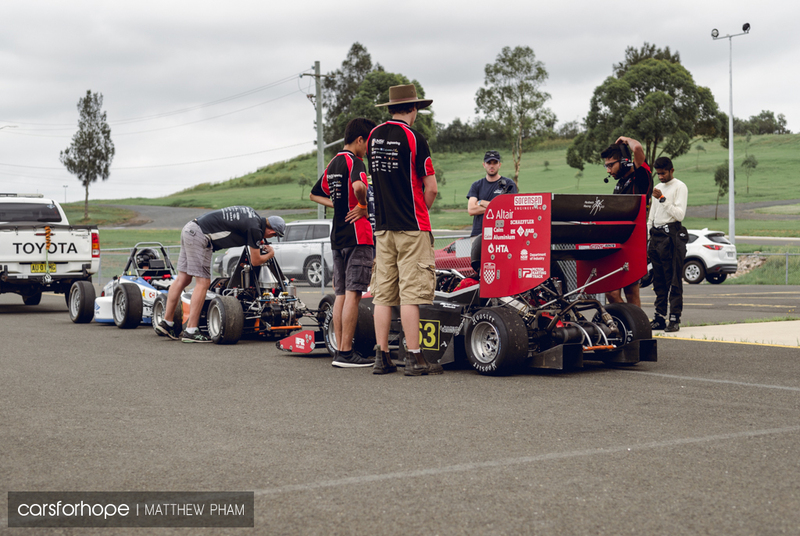 I arrived first thing in the morning to see the teams hunkered down in the pits preparing their cars for the final events following scrutineering and the first sessions in the days prior. I took some time to check out some of the cars up close and personal, making sure to keep out of the way of the teams in the confines of the pit garage. 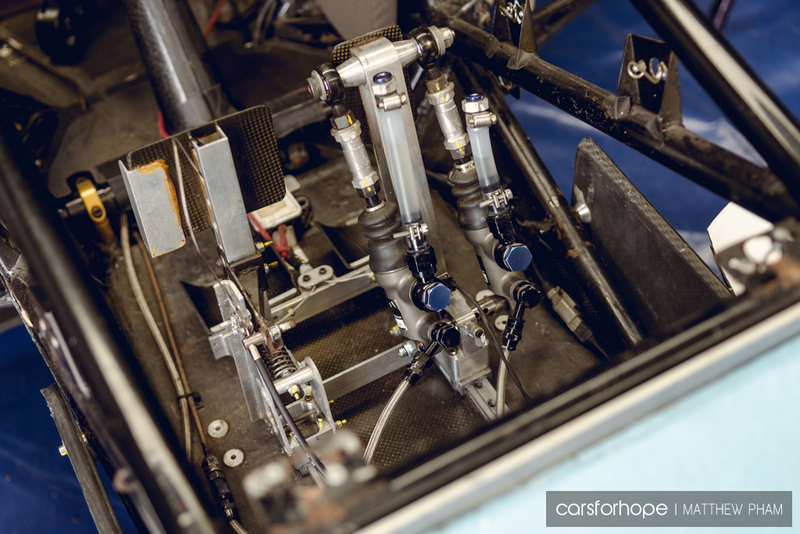 Given my thesis revolved around the design of our car’s pedal box system, naturally that was my first port of call scoping out the cars I hadn’t the chance to see up close before. 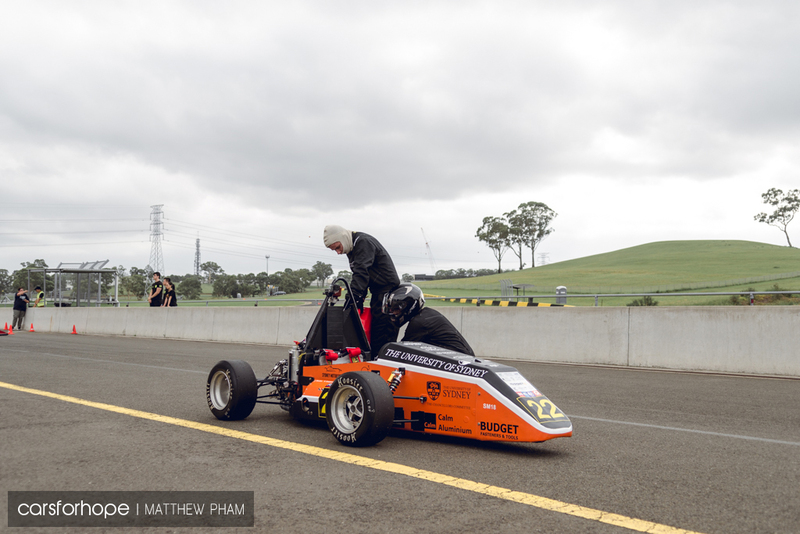 Monash Motorsport’s concoction looked super lightweight and refined, plus had the benefit of being semi-adjustable too. 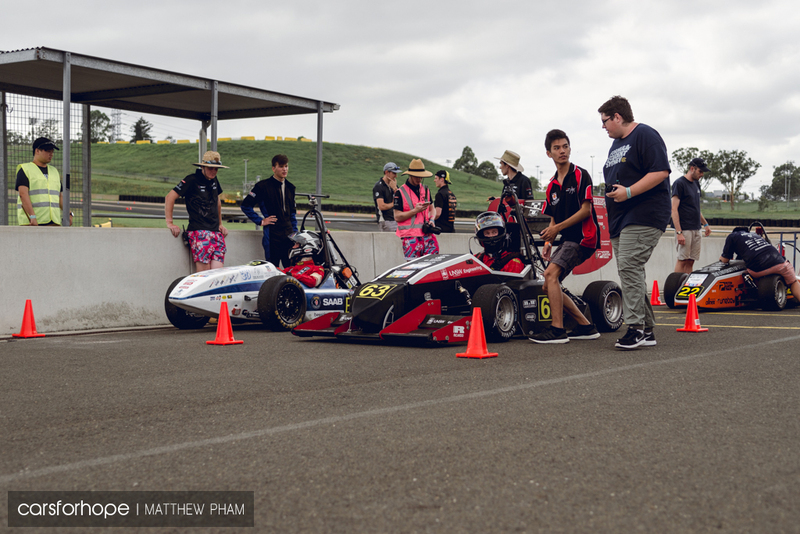 To keep everything running safely and smoothly, cars would be going out on track one-by-one for the Autocross and Endurance events, which included driver swaps. As I returned from the teams briefing, drivers were beginning to get comfortable in their racesuits. 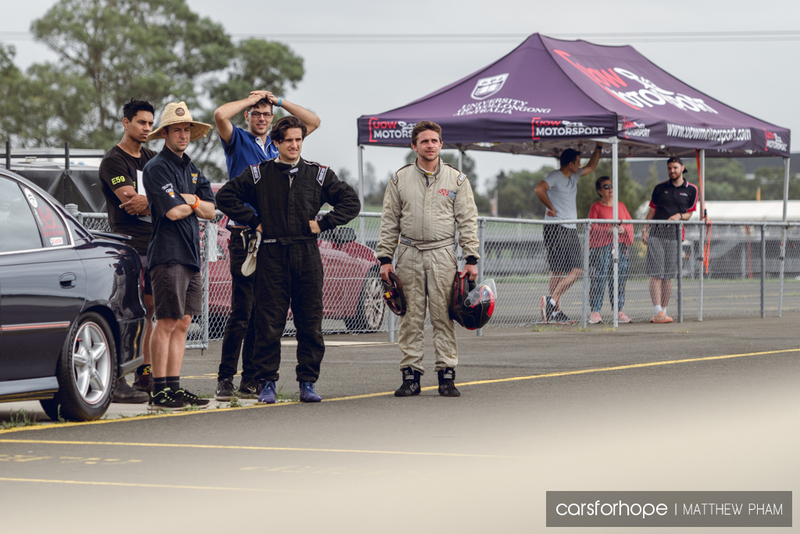 …and their game faces were on. 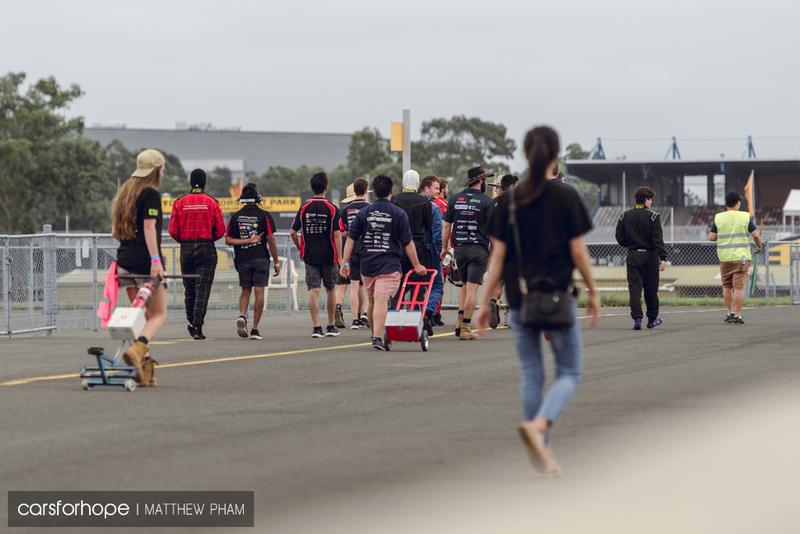 Race cars never guarantee reliability, but almost all of the cars rolled into pit lane and onto the track for the initial sighting laps before the day’s proceedings, which was a promising start. 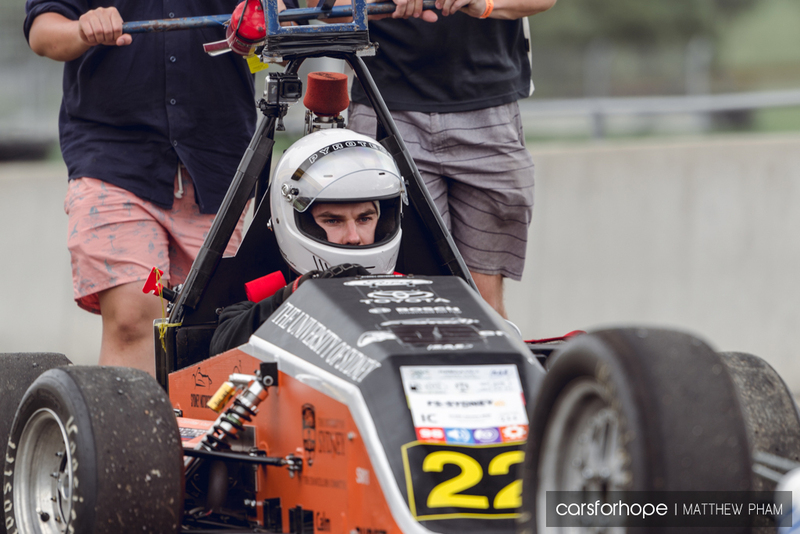 The first few minutes of track time are often the most nerve-wracking as team members become helpless to essentially a lone driver on track, supported only by hearing the announcements over the radio network whilst the cars drive out of sight. 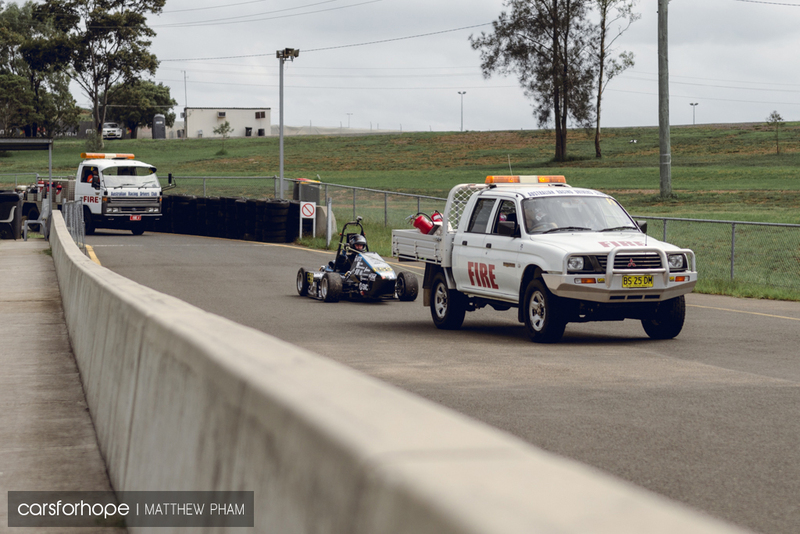 As I headed out onto track for a glimpse of the action at the back of the Amaroo Circuit, the format was very time attach-esque, with single-car runs attempting to post the fastest lap times. 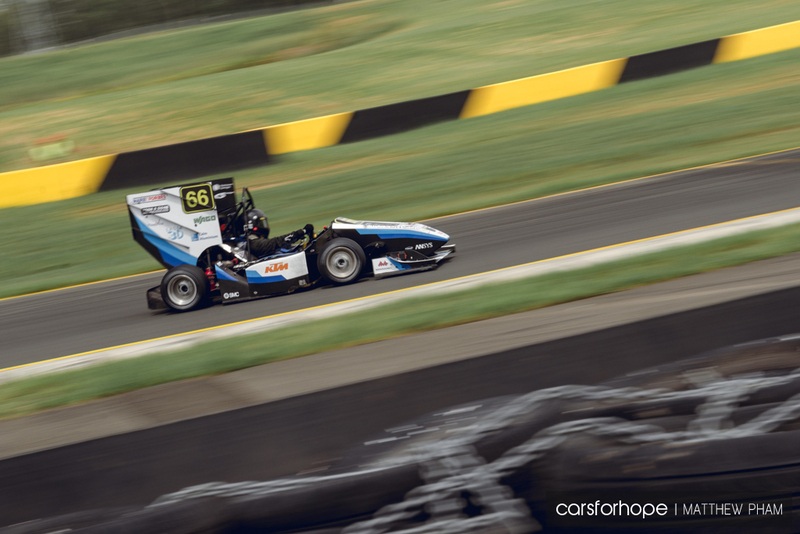 It was actually refreshing to watch (and photograph) slower and smaller cars than I would usually see at the track every other day of the year. 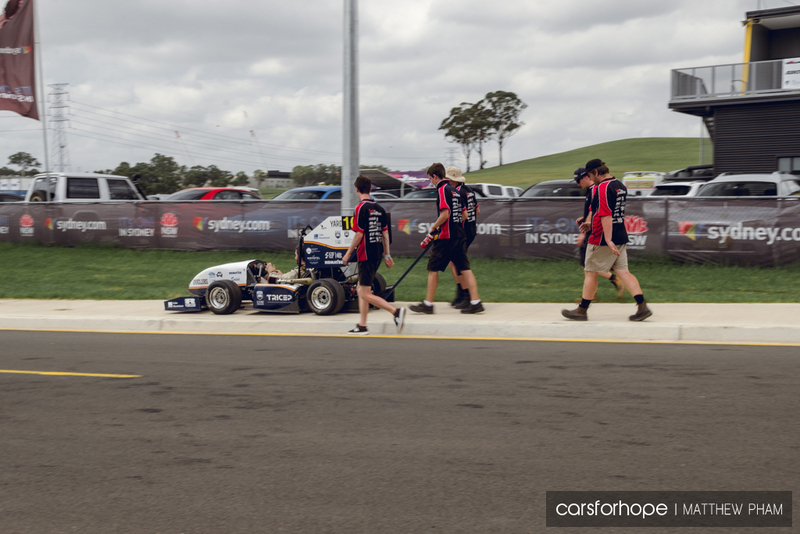 In the quiet morning the IC cars were loud, their motorcycle engine notes reverberating around Sydney Motorsport Park. 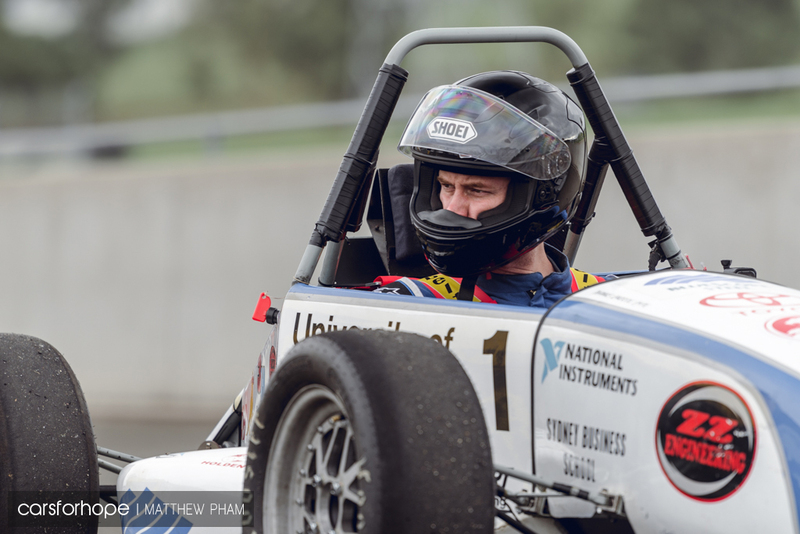 The same could not be said, however, about the EV class, although if you used your imagination University of Adelaide’s car sounded like a substantially quieter version of Mad Mike’s quad-rotor FD RX-7. 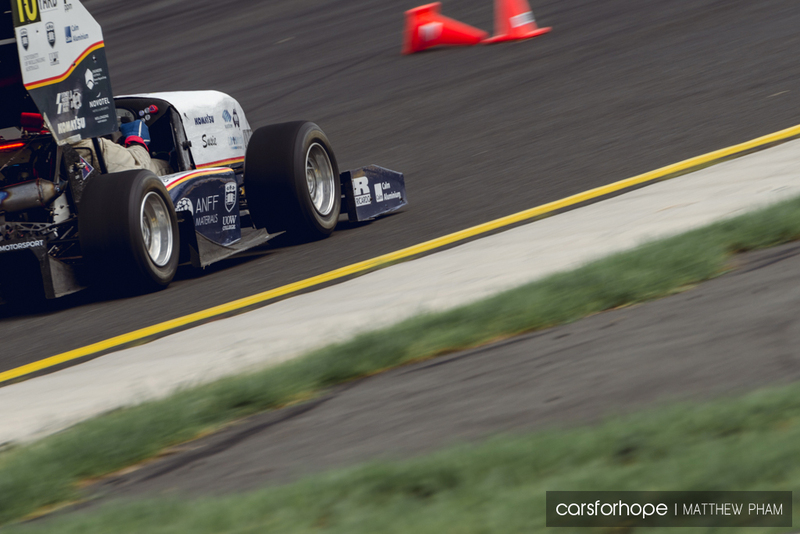 UTS Motorsport’s EV showed phenomenal pace and looked very composed navigating the track cones. 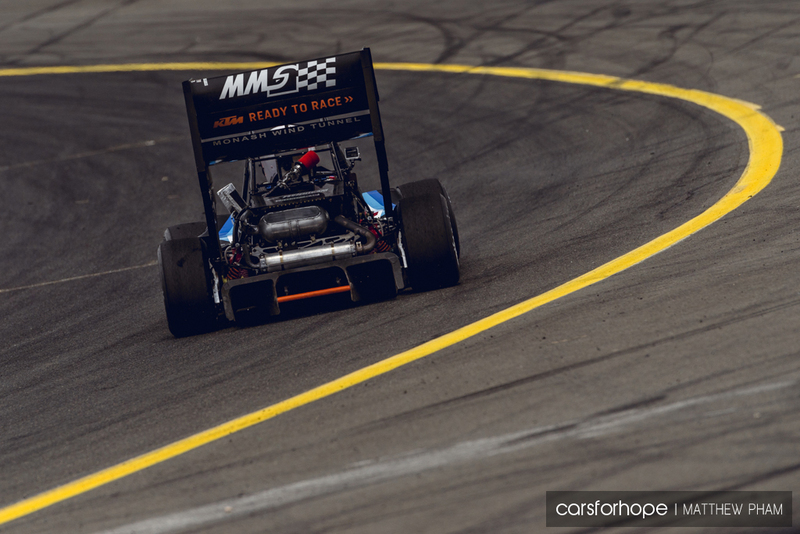 There was something about that car that drew me back to it time and time again, even in the pits. 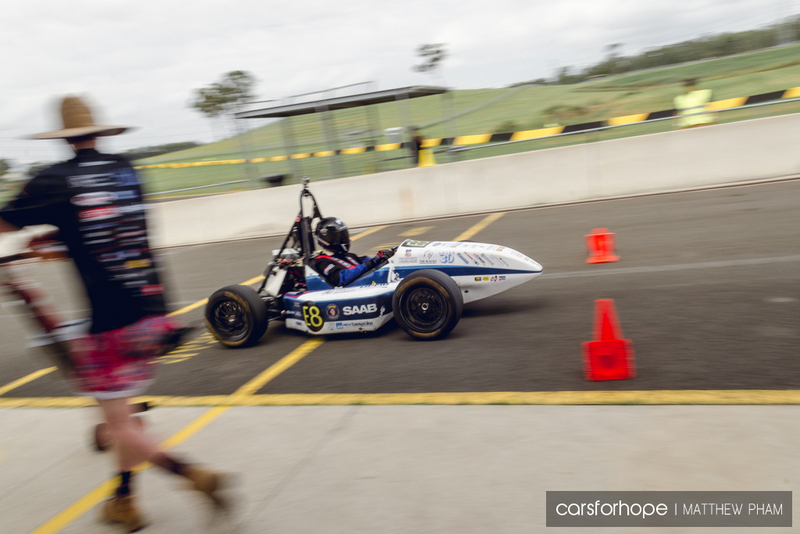 Maybe it was its performance on track despite limited aerodynamic aid. Maybe it was the way the team presented it. 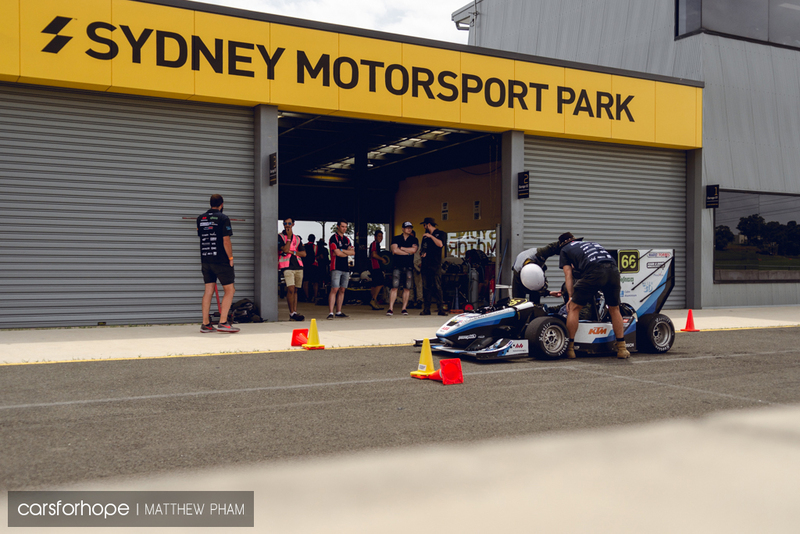 Back to the IC class, Sydney Motorsport experienced power troubles in the early stages of the day, requiring frequent tows from the rescue crew…. 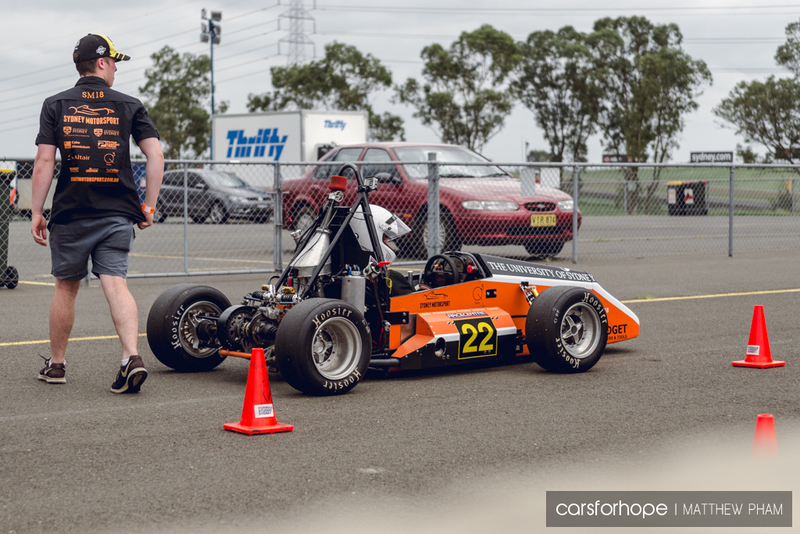 …and frequent top-ups of the fuel tank as well. 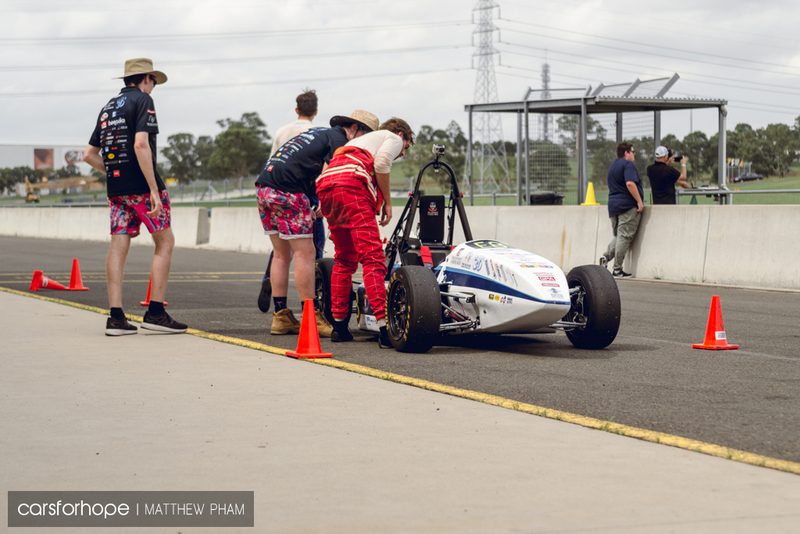 It was a silver lining given the engine issues experienced in the lead up to Formula Student Sydney, which almost jeopardised their attendance entirely. 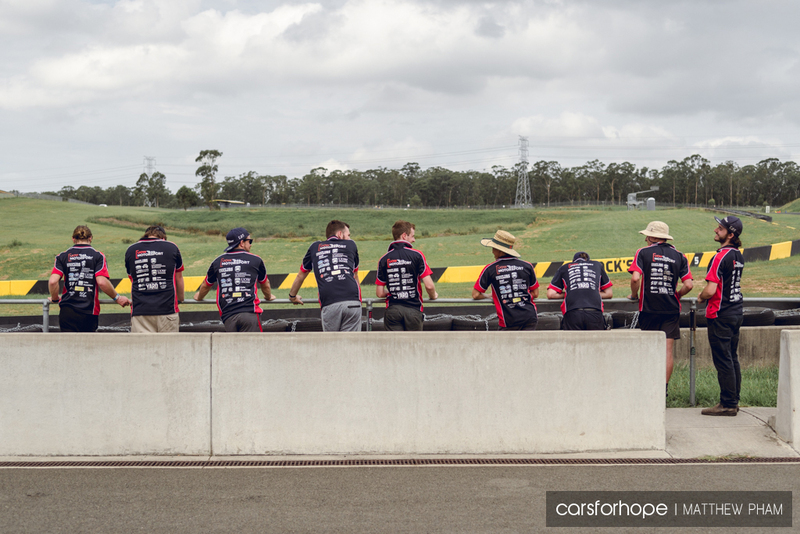 But it is a major credit to the team for making it in the end, especially as they only had a skeleton crew on hand. 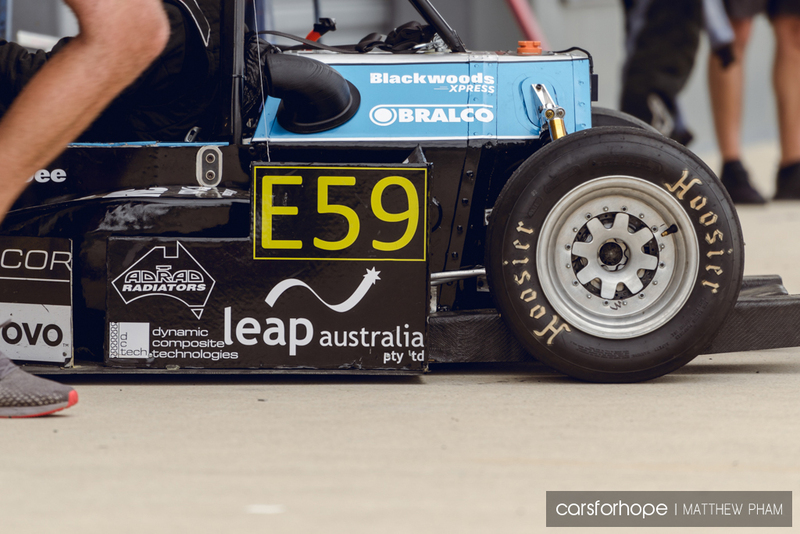 Their car was well presented , as one of the only IC teams without aerodynamic aid, and featured a distinctive engine note courtesy of the Aprilia engine. 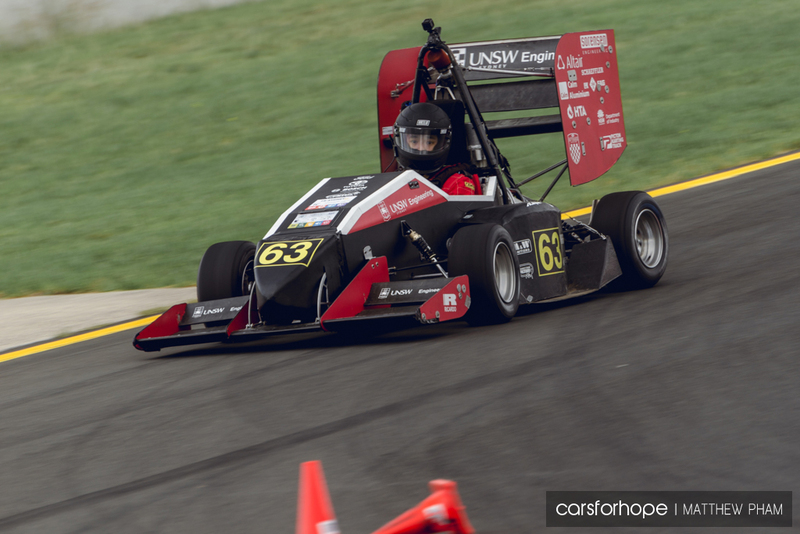 I’ve seen UNSW Redback Racing refine their car over a few years now, and every year it looks like they’re making continual progress. 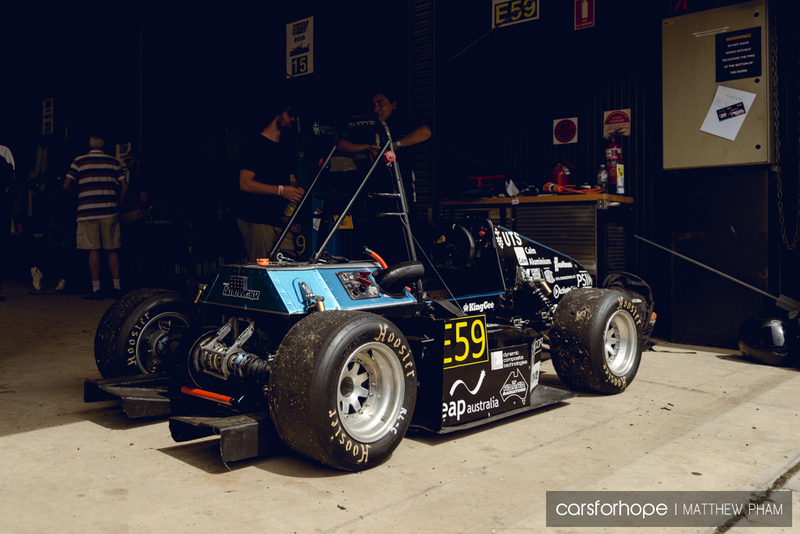 If I remember correctly, they were one of the first NSW teams to adopt a monocoque chassis construction compared to the traditional tube frame. 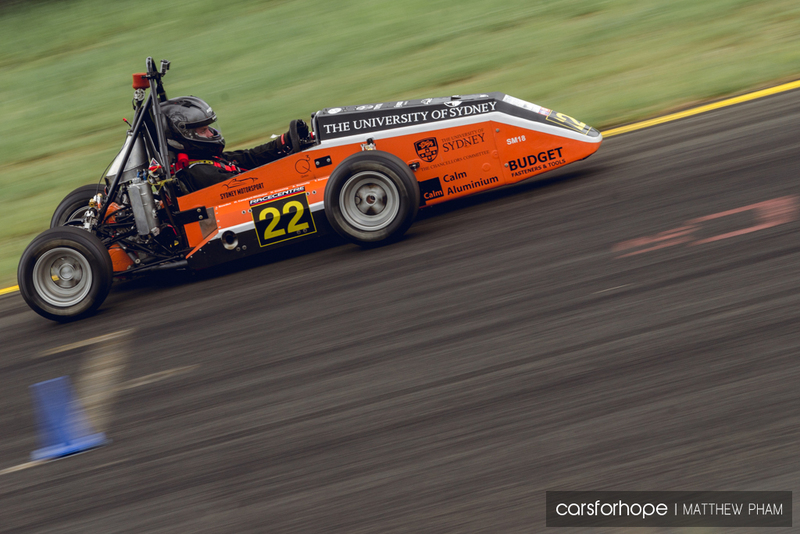 Formula Student Sydney was also the first time I’ve seen the car with a hefty aero package as well. Here’s another angle which shows the complexity of their design. 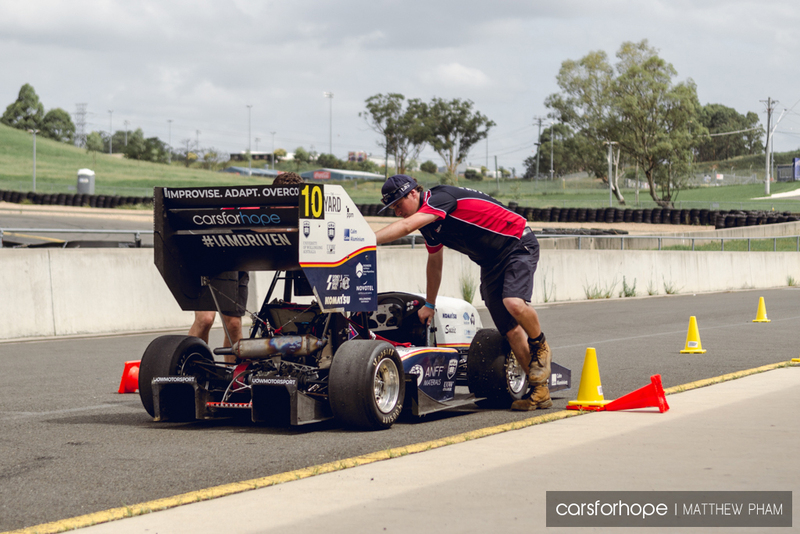 It was also a great time to hone their driving skill given the relaxed nature of the event. 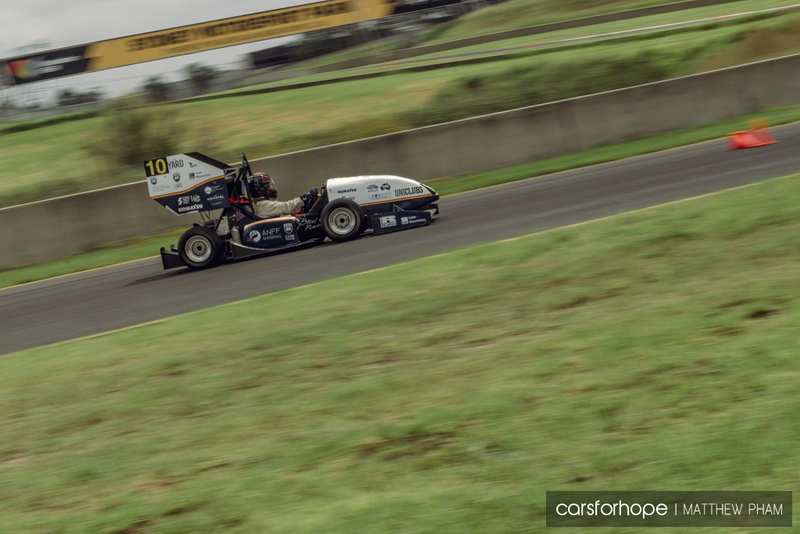 Monash Motorsport, however, were all guns blazing from the get-go. 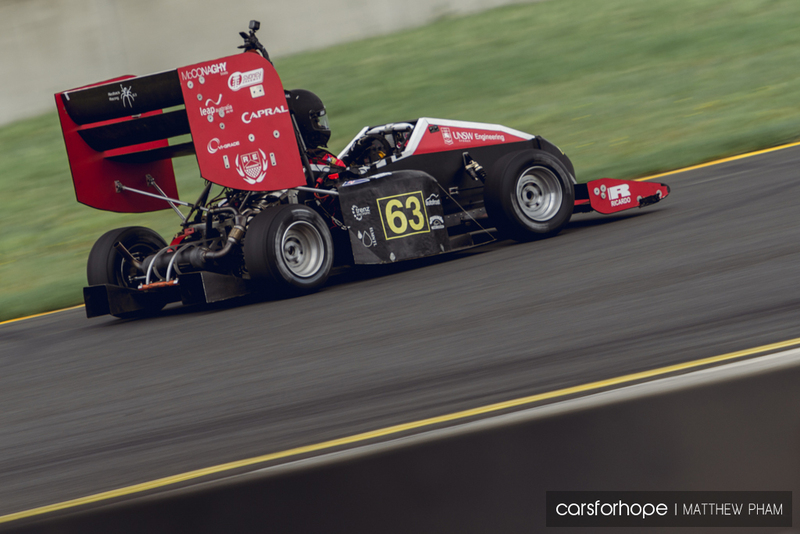 I was almost awestruck watching not only how fast their car was, but also how accurate and composed their drivers were. 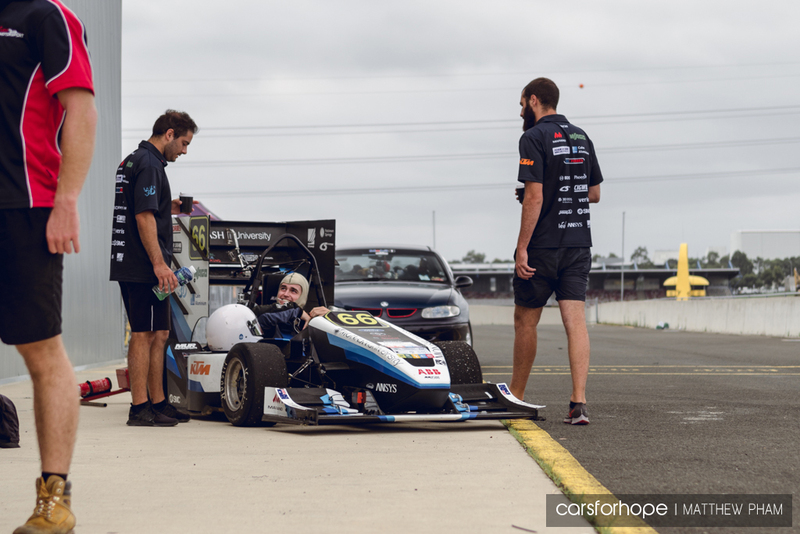 It seemed like a walk in the park for them, seldom touching their car between sessions in the pits but they showed no signs of backing down when it came to the battle on track. It was to be expected though, as they have been the Australasian competition favourites for the the past 5 years or more. And there has been a lot they have achieved in the past 5 years, too, even putting it up against some European teams (the world’s elite) a few years ago. 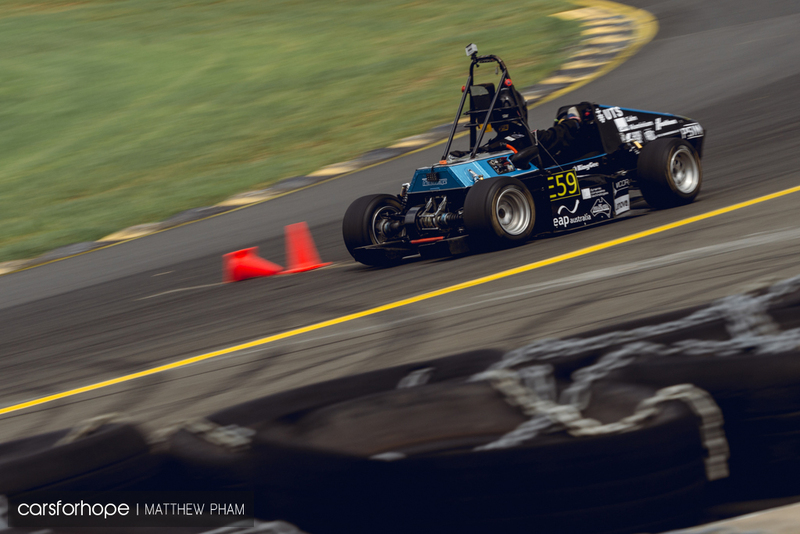 Stylistically the Monash Motorsports car hasn’t significantly altered its guise in that time, but why break a winning formula? 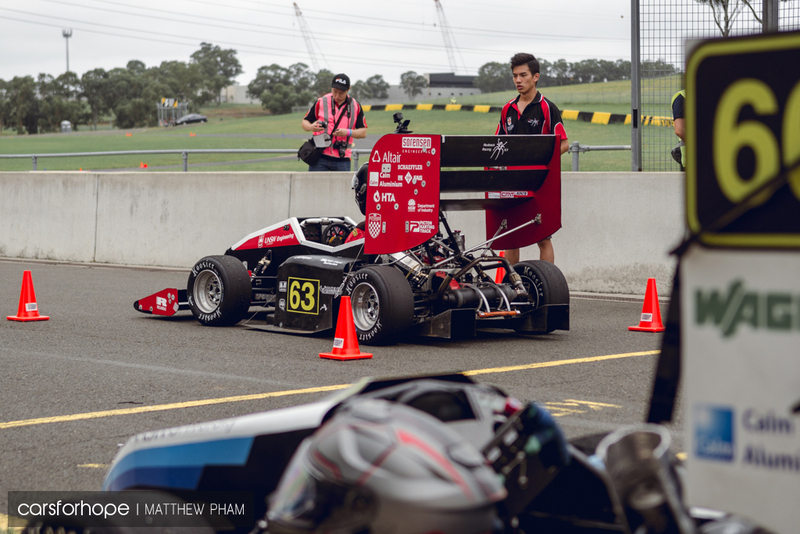 One impressive feature to note is the Formula 1 inspired DRS system, which I monitored for a few laps as the car crossed the front straight. 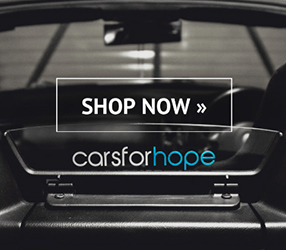 It was perfect in its execution, but I’m interested to learn about its real benefit since the cars don’t get up to high speeds in competition, in relative terms. 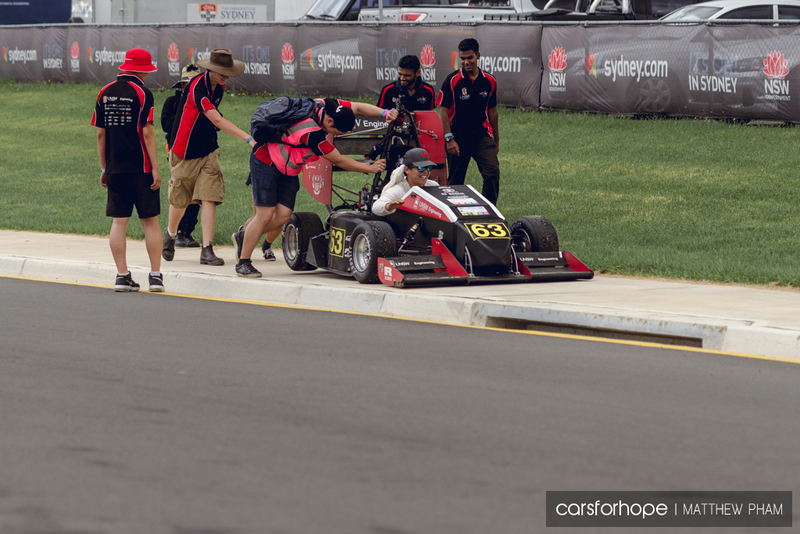 After skipping the morning sighting laps after some late night repairs, UOW Motorsport were out on track with their 2018 car Suzie. 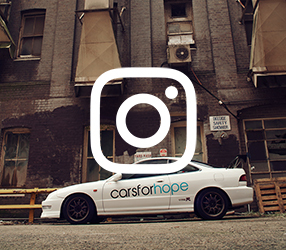 We were fortunate enough to have a drive of her in the past, and it really was a different experience! I might be a little biased, but for me that livery is spot on. 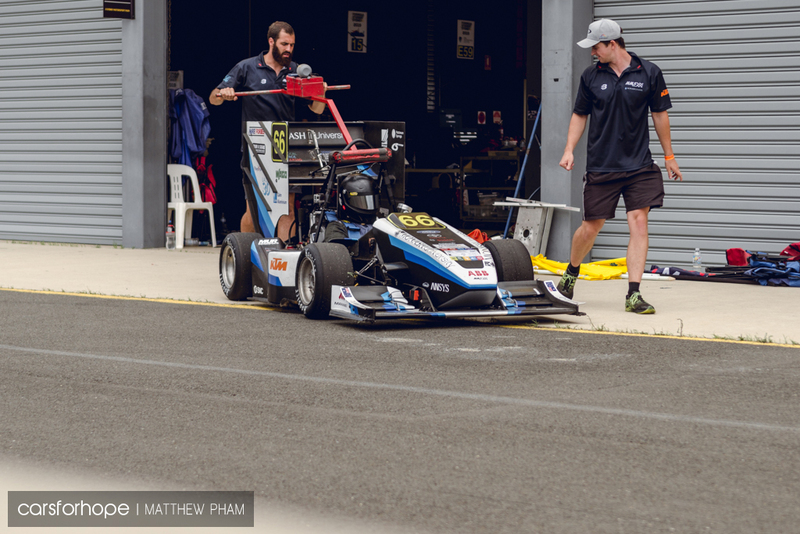 It’s a hark back to UOW Motorsport’s first car (which featured the same livery), but also reminds me of the Rothmans Porsches from the 80s. 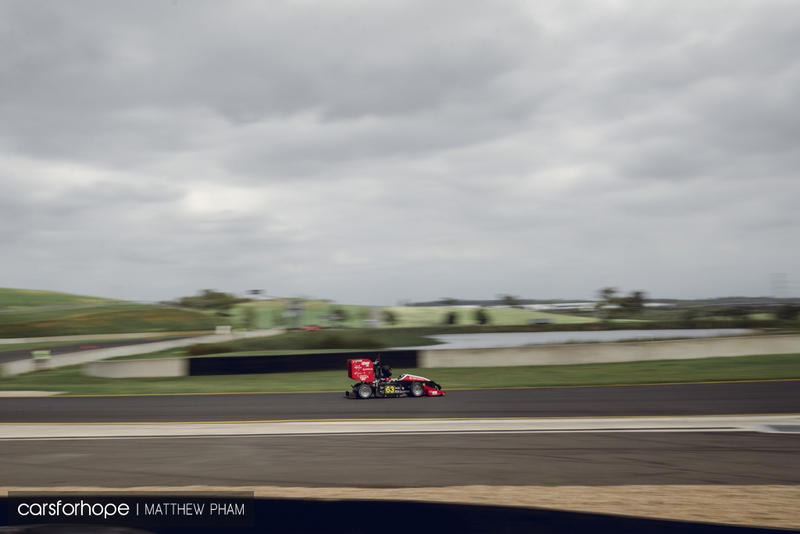 The afternoon session gave a few solid hours of Endurance running for all cars, with a driver swap at the halfway point of each run. 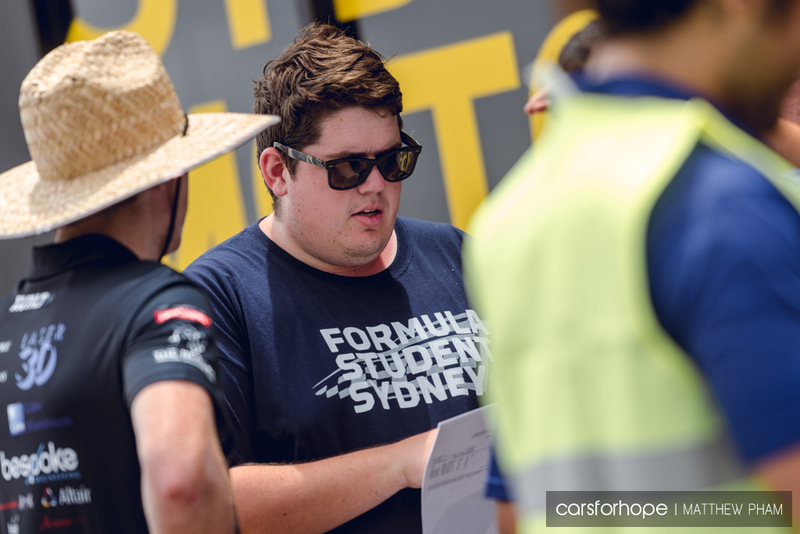 Meanwhile Anthony was still running around pit lane wielding multiple radios and a deadly clipboard. 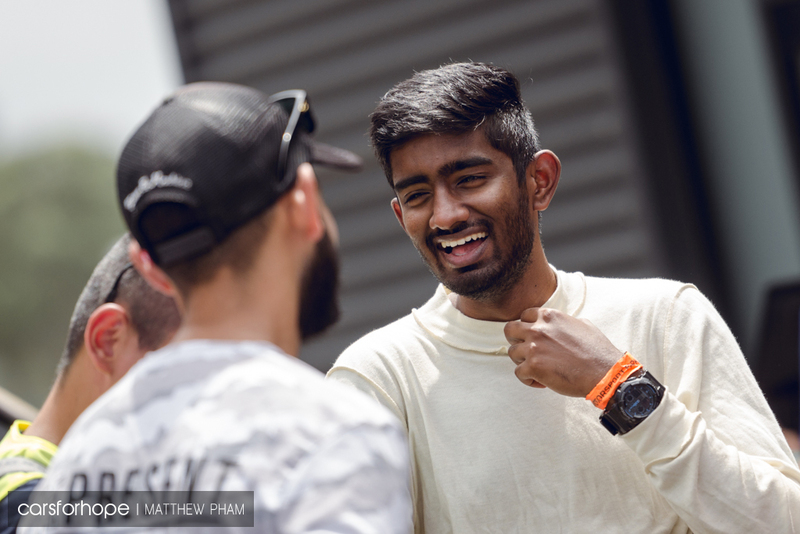 All of the teams seemed to have ironed out any complications from earlier in the day, and the afternoon was looking like a smooth one for all. 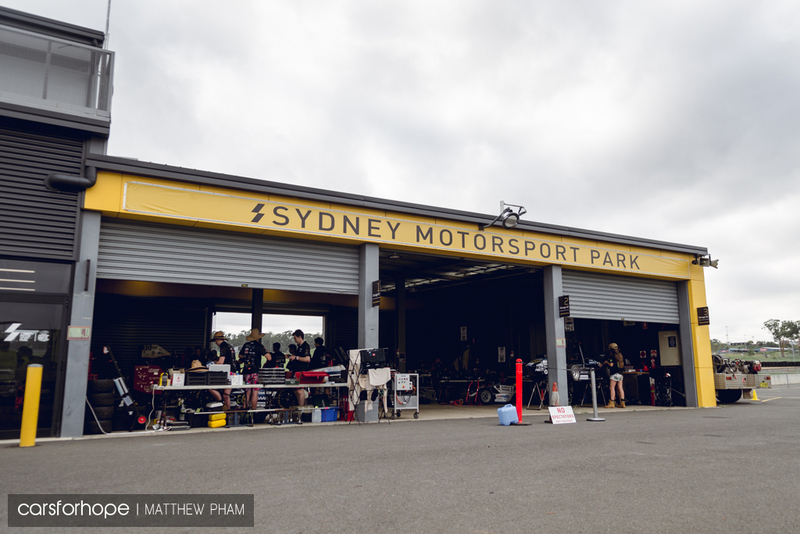 And that included Sydney Motorsport, who I felt suffered more injury than most during the day. 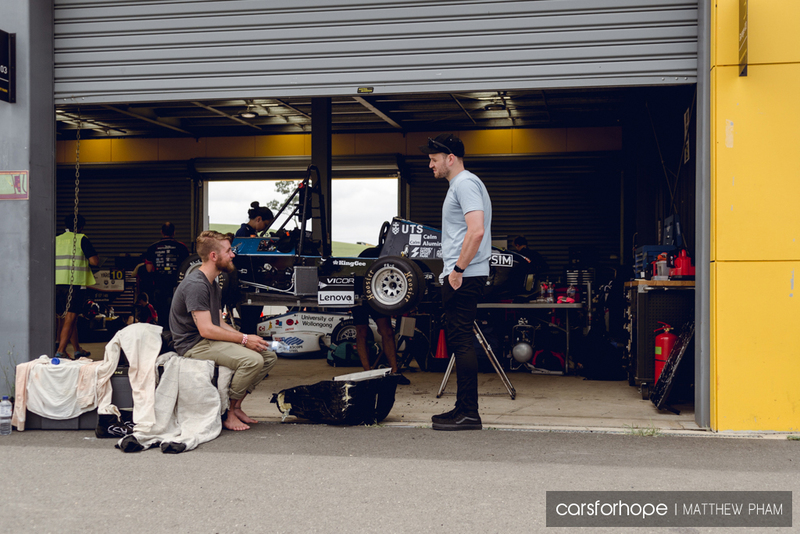 …until it looked like they ran out of power in the second half of their Endurance session. It was a sour end to the start of the team’s 2019 campaign. 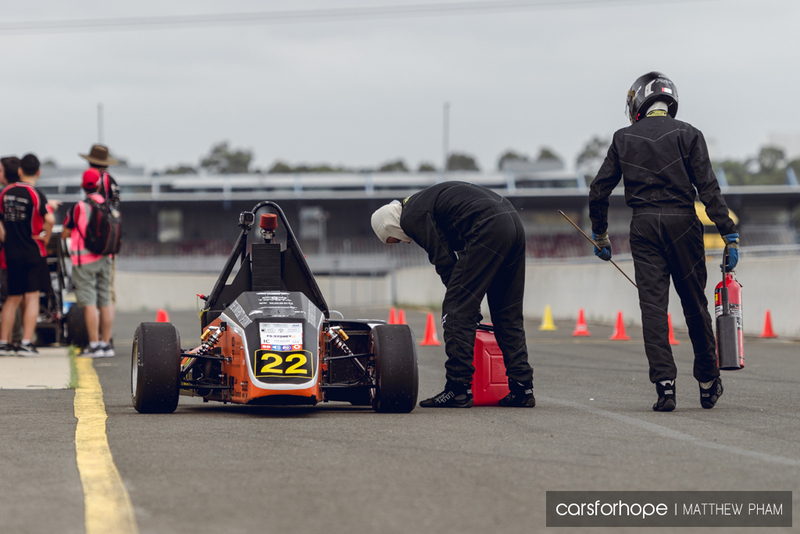 Let’s hope they diagnose the problem and return for a strong result in the F-SAE competition at the end of the year. 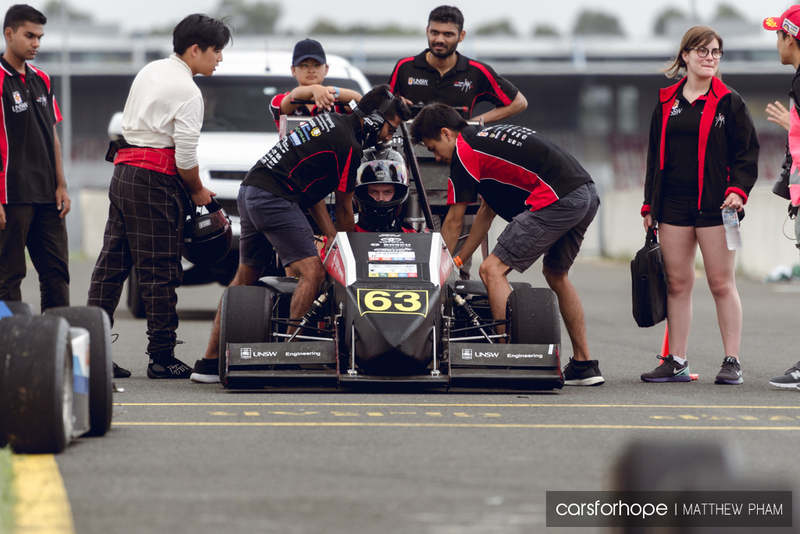 It was an eventful session for the EV teams, with Adelaide Motorsport experiencing more intermittent power problems in the beginning of their run. 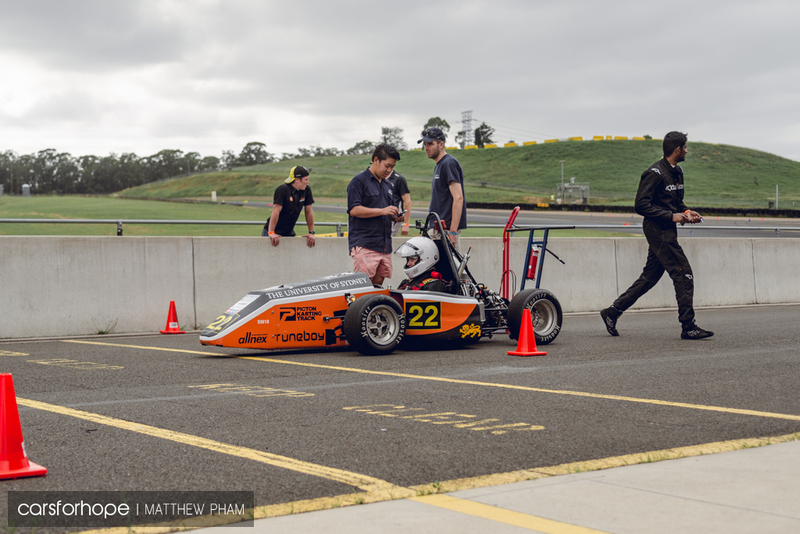 The awards ceremony at the end of the day heralded not only the engineering aspect of the competition but also the business approach, including Best Social Media Coverage among others. 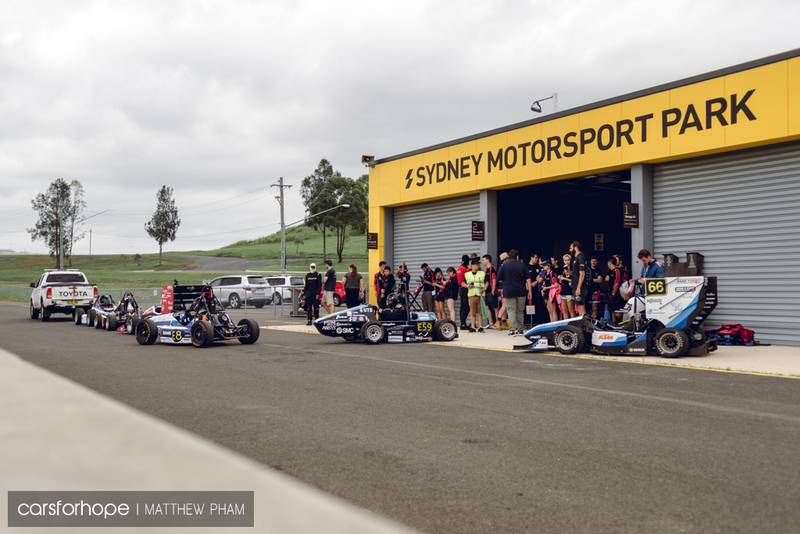 Traditionally run across multiple locations in Victoria, Formula Student Sydney showcased the opportunity for an event to be run in parallel to the original. I think it was quite the success for an inaugural event, which shows a lot of potential for expansion in the future. Perhaps the official event will be held away from Victoria for the first time within the next few years? 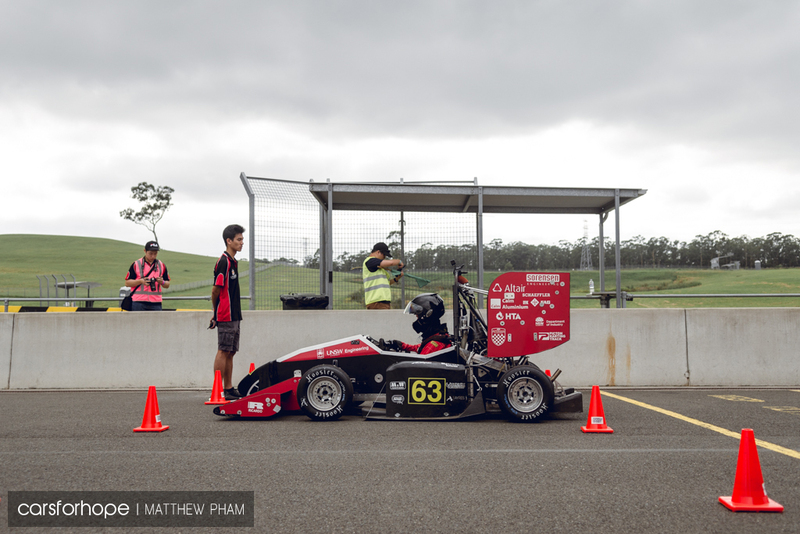 Maybe it’ll mix up the field by relinquishing Monash Motorsport’s hometown advantage. 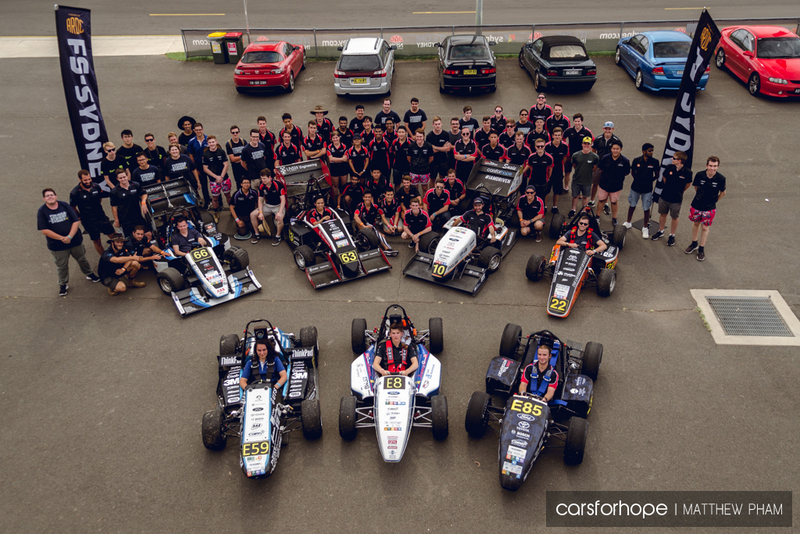 Without any further speculation, we’d like to extend a big thanks to Anthony and UOW Motorsport for inviting us to hopefully what was one of many Formula Student events to come, and wish all of the teams the best for the competition in December. See you next year at the same time.